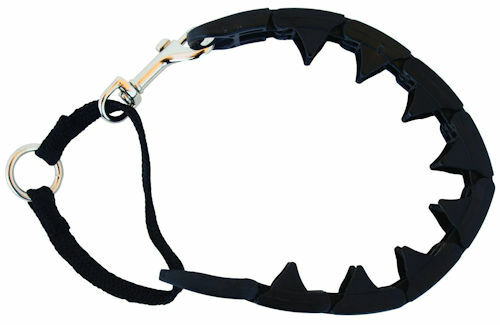 Put an end to pulling and lunging behavior while your dog is on leash with this Starmark Pro Training Collar. This collar fits on easily, and features a patented, linked "watch band" design that allows you to size it to perfection. As a training tool, it allows you to gently yet effectively establish yourself as the pack leader. Instructions: Angle the links so the tips are touching. Using your thumb and forefinger, snap the links together by fixing each hook to bar one at a time using a firm left-right rocking motion. To remove the collar, use your thumb and forefinger to unsnap each hook from their bars.The collar should be snug, but not tight around your dog's neck. Do not attempt to slide the collar over your dog's head.